If you’re still looking for a place to diversify your money by putting it in a non-traditional investment, I’d like to shine the spotlight on Lending Club. It’s a fixed income investment that you won’t find in your run of the mill brokerage firm, but it’s one that has become quite popular with the online crowd (and some personal finance bloggers). I’ve covered them pretty regularly on this site as I think they are a great way to diversify investment funds, particularly if you’re tired of the zig zagging stock market and have parked your money in enough bond funds and high yield CDs for the time being. So if you’re feeling a little more adventurous and would like to give a new type of investing a spin, then I’d encourage you to check out the concept of peer to peer lending. I plan to keep up with the latest Lending Club promotions here. There are a lot of additional incentives for joining Lending Club, beyond just the current average 9.6% net annualized returns they have for investors. On occasion, they’ll have promotions that give away cash bonuses to existing investors as well. At this time, there is no active promo in place but existing accounts may receive occasional benefits over time. Here’s how to sign up with Lending Club. I find that Lending Club is one of the most generous companies when it comes to doling out free cash to their members. The great thing about them is that they provide a variety of different, seasonal promotions throughout the year, so the offers may change every so often. If you’re willing to fund your account with just a little more, they’ll often give you a little extra to encourage you to make that move. Thus, several promotions are tailored towards both new AND existing lenders, as an incentive to grow one’s investment account. For example, here are some offers that were available in the past, but are now expired. 1. You can earn up to a 2% cash bonus (or some percentage of your deposit) if you open a new investor account with Lending Club. You’ll have to register an account, then fund it within 45 days of registration. You’ll have to keep your funds fully invested in this account, also within 45 days of getting registered. Once this requirement is fulfilled, you’ll be approved for the bonus and you can expect it to be deposited into your account within 15 days of approval. Note that this is a taxable payment that you’ll need to address in your tax return. This offer can change at any time. 2. Tiered Bonuses for Existing Accounts. This involved a cash bonus that was given to current investment account holders, with the bonus amounts tied to the size of new funds that were added to existing accounts. An additional $1,000-2,499 transferred to an account garnered a $50.00 bonus. An additional transfer of $2,500-4,499 yielded a $100 bonus. An additional transfer of $5,000 or more picked up a $150 bonus. If you transferred an additional $10,000-24,999, you received a $200 bonus. If you transferred an additional $25,000-49,999, you got a $500 bonus. If you transferred an additional $50,000-99,999, you got a $1,500 bonus. If you transferred an additional $100,000 or more, you got a $4,000 bonus. When these offers come up, you’re typically required to enroll in their cash bonus program (e.g. you are sent email notices about this). As a member, you’ll be receiving occasional enticing messages like this that invite you to opportunities that can earn you even more money. 3. $2,500 Giveaway. In late summer of 2009, LC actually gave away a $2,500 cash prize to one lucky investor whom they identified as their 25,000th member. It was as simple as registering a new account with the P2P lender. 4. One Time Cash Bonus. In late fall of 2010, LC promised a $100 to new investors who invested at least $2,500 within 45 days of signing up. This was an immediate 4% cash boost that was applied to the initial investment. 1. The annual rate of return for investors is over 9.6%. That’s a pretty sweet return relative to a lot of investments we’re seeing today. Just take a look at this chart! 2. Lending default rates are quite low. 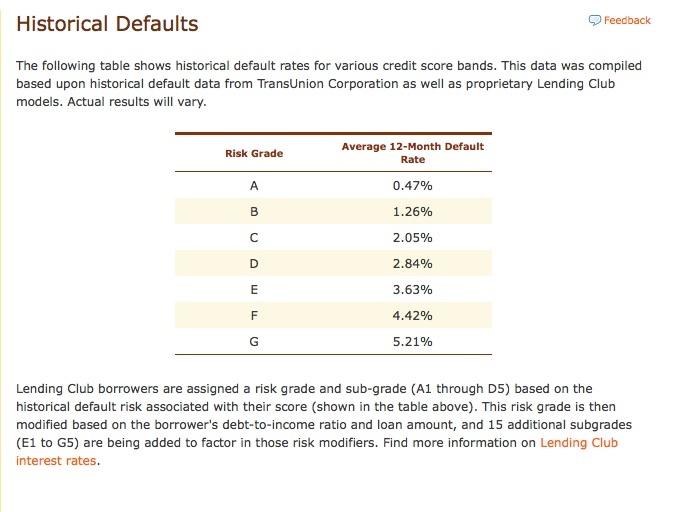 Check this graphic for historical default rates at Lending Club — as you can see Grade A loans (the most conservative loans) have an average 12 month default rate of only 0.47%. In fact lately, they’ve reported that there have been no defaults for the most conservative investments. 3. To invest, you can make deposits by using Paypal, ACH, checks or via wire. 4. Only investors from certain states can participate at this time. You are eligible to invest if you reside in any of these qualified states: CA, CO, CT, DE, FL, GA, HI, ID, IL, KY, LA, ME, MN, MO, MS, MT, NH, NV, NY, RI, SC, SD, UT, VA, WA, WI, WV, or WY. 5. The minimum investment is only $25. This is the initial deposit needed to get started with the investing process. You can then build a loan portfolio with Lending Club notes and diversify your holdings by using the Lending Club Builder Portfolio tool. Plus, you can link your account to a bank account pretty easily. 6. Your investments are in fixed income notes with 3 year terms. You lend your money out and in the process, you hold on to 3 year notes. 7. There’s a low service charge of 1% taken from earnings you receive from borrowers, but your annual returns will be impacted by less than this amount based on the way Lending Club makes calculations. 8. Loans can be traded (bought and sold) via a Note Trading Platform that’s operated under FOLIOfn. There are some limitations as to who can use this trading platform and there’s a 1% trading cost for doing trades. One more thing to note: The Harvard Business Review named Lending Club as one of the Top 20 Breakthrough Ideas of 2009. For those who are seeking more information about peer to peer lending, here are some of the articles I’ve written on the subject of investing with Lending Club. Lending Club Investment Performance: Should You Invest Via Direct Lending? All investments always carry risks, so make sure you review as much information about this as you can before you delve in! Promotions also exist for those looking for a Lending Club loan. Check out our special deals for Lending Club borrowers here. Lending Club Return On Investment: Should You Invest Via Direct Lending? I think the idea of peer to peer lending is a good idea. However, while you can get some healthy returns, there is also a risk factor to think about. At the end of the day you are simply loaning to an individual. Make sure you are only investing risk capital. Also, if you want to get out of the norm, consider corporate or municiple bonds – some of them have aggressive rates of return as well. @BasicMoneyTips — thanks for bringing up the matter of risk. I have written about it extensively in some articles I have linked to in the article above. I didn’t really discuss it here as I’ve covered it in depth (I feel) in my other posts. Check out the one on “building a loan portfolio” and the one on “Lending Club investment portfolio” for more details. Not every investment is the right one for you. And it’s not a good idea to “put all eggs in one basket” as the cliche goes. This kind of investment may serve as a decent diversifier in a well balanced portfolio. But like anything else, you CAN lose money. So yes, study it carefully and see if you’re comfortable with it before participating. What’s interesting is that Lending Club makes the whole diversification process easier via their tools. For any of the skeptics out there. I can say I’ve been doing this for over 1 year now. With almost 3k invested, I’m getting a return of 12%. Currently no defaults and 3 paid back early. I post updates on my blog quarterly about my performance and experience. In this scenario 2% of those borrowers to whom you have lent will default. There are two important aspects to this. 1. Risk of default applies across the length of the loan. It could occur in the first few months or later after receiving some payments. 2. Your loss is contained within the 2%, If your portfolio works according to historic results, 98% will continue to pay as planned. You will receive 10% on your investment less the dollar amount associated with the unpaid balance on the 2% which by definition is 2% or less. So your return will be 8% or better in this scenario. It is better to the extent that the 2% made some payments and did not default on day 1. Hope that provides some context. Still buyer beware, and remember the 2% default rate is a historic result and does not necessarily predict future results. I’ll try anything which doesn’t need purchasing. Good post and people should click on your link to Lending Club. For those who want to learn more, I recently interviewed Lending Club’s CEO Renaud Laplanche to answer a bunch of questions that most people have about Lending Club – you can listen to that interview here. I HATE Lending Club right now…it won’t let us Maryland’ers register. Right as I finally decided to give it a shot too. I’ll get you some day LC, just you wait! Sorry J. Money… We’re getting rich while you aren’t. Too bad, so sad….! Okay, just kidding you of course 🙂 ! Hope they open this up to the whole country soon. It’s a great investment! By the way, the reason why certain states aren’t able to participate in Lending Club yet — apparently it’s to do with Lending Club experiencing bureaucracy with passing certain financial regulations in these states. It’s nothing inherent about the business of course, but rather just how slow people (the powers that be) are about reviewing these new businesses that are wanting to operate in these states.